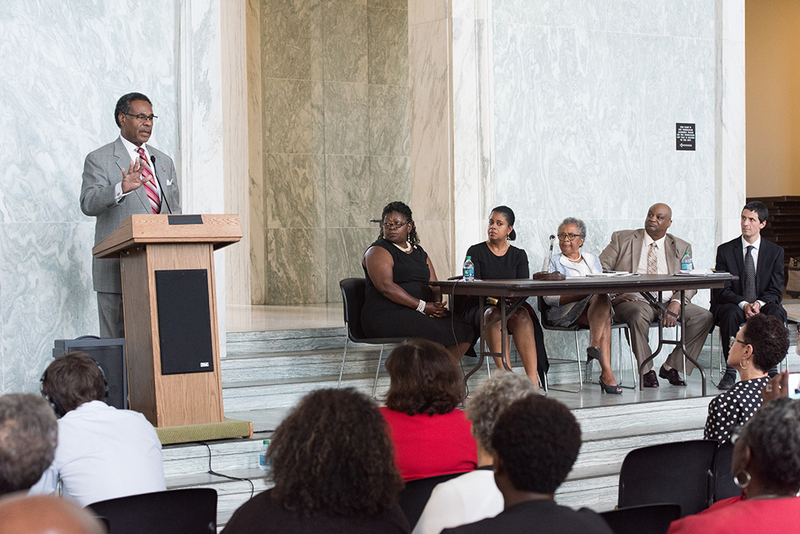 The Cold Case Justice Initiative (CCJI) hosted a briefing on the Emmett Till Reauthorization Act of 2016 in the Rayburn House Office Building in Washington, D.C., on September 12. The event was sponsored by Rep. John Lewis (D-GA) who along with Sen. Richard Burr is leading a bipartisan effort to pass the legislation. At this special event Paula Johnson and Janis McDonald, Professors of Law and Co-directors of CCJI, and members in a coalition pushing for reauthorization came together to address the profound necessity for this effort. The Coalition for Emmett Till Reauthorization Act, comprised of organizations including the NAACP and Southern Poverty Law Center, fellow institutions of higher education Northeastern University and Emory University, members of Emmett Till’s family, and activist Alvin Sykes. On July 18, the U.S. Senate unanimously approved the legislation, which now must be passed by the U.S. House of Representatives. The Senate co-sponsors of the bill include Sen. Claire McCaskill (D-MO), Sen. Patrick Leahy (D-VT) and New York Senator Charles Schumer (D-NY). In the House, Rep. John Katko (R-NY) of Syracuse joined a bipartisan group of legislators calling for the House’s passage. Both Rep. Emanuel Cleaver of Missouri and Sen. Burr of North Carolina were on hand to explain their support for reauthorization. 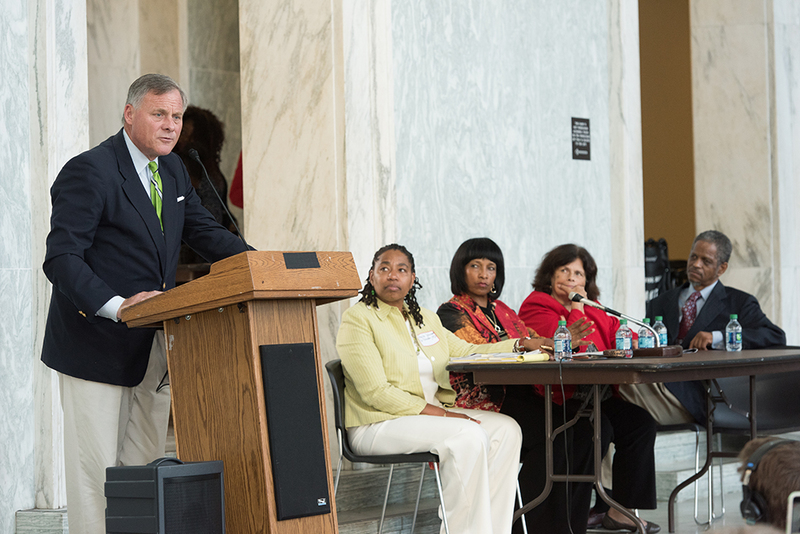 When Sen. Burr approached the podium and spoke he pledged that he and his fellow co-sponsors were committed to seeing the Bill passed before Congress left to campaign for election season. “The only sunset provision we need is when we know that we have no more cases to investigate,” said Burr. In its effort to build public support and create further pressure on the House to pass the Bill the coalition has started on online petition on Change.org. A reauthorized Act will require a full accounting of victims, a more thorough investigation of cases, more staffing by the Department of Justice, and expedited Freedom of Information Act (FOIA) responses. Other participants at the briefing included representatives from families dealing with the killings of relatives. Cordero Ducksworth, the son of Cpl. Roman Ducksworth, spoke about the circumstances around his father’s killing in 1962 when he was shot by a local police officer in Mississippi in a dispute over segregated seating on a bus. The CCJI has worked with his family to provide information and justice in this case. Two Families who are working with Northeastern School of Law’s Civil Rights and Restorative Justice Project also had a chance to share their stories. 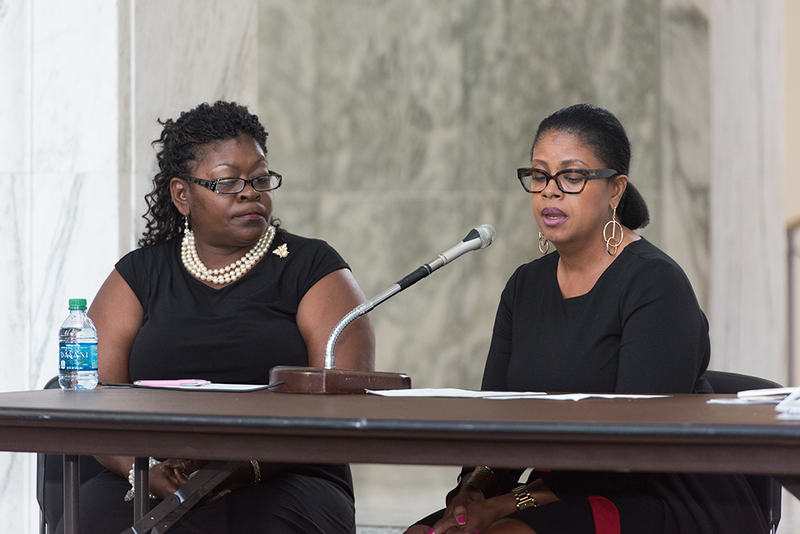 Jannice Hutson-Leon and Sheila Moss-Brown represented their families during the briefing. Ellis Hutson Sr. was shot to death by a constable in 1948 when he went to bail out his eldest son who had been unlawfully arrested in Nacogdoches, Texas. While in 1947 Henry Gilbert was tortured before being shot by police officers in Harris County, Georgia. Gilbert was being held on the charge of harboring a fugitive from justice when he was killed. Investigative journalist Ben Greenberg who has worked with the CCJI and the Ducksworth family on their case used his time during the briefing to discuss why he felt it necessary for the House to pass the Reauthorization Act. The event was held in conjunction with the Coalition for Emmett Till Reauthorization Act: The Civil Rights and Restorative Justice Project, Northeastern University School of Law, Cold Case Justice Initiative, Syracuse University College of Law, Emmett Till Justice Campaign, Emmett Till Legacy Foundation, Georgia Civil Rights Cold Cases Project at Emory University, Leadership Conference on Civil Rights, Mamie Till Mobley Memorial Foundation, NAACP, NAACP Legal Defense Fund, National Urban League, and the Southern Poverty Law Center. An interdisciplinary project that engages Syracuse University College of Law faculty and students, the Cold Case Justice Initiative seeks justice for racially motivated murders during the Civil Rights era and beyond on behalf of the victims, their families, local communities, and society at large.